New England Patriots tight end Rob Gronkowski (87) warms up during a practice Thursday, Feb. 1, 2018, in Minneapolis. The Patriots are scheduled to face the Philadelphia Eagles in the NFL Super Bowl 52 football game Sunday, Feb. 4. 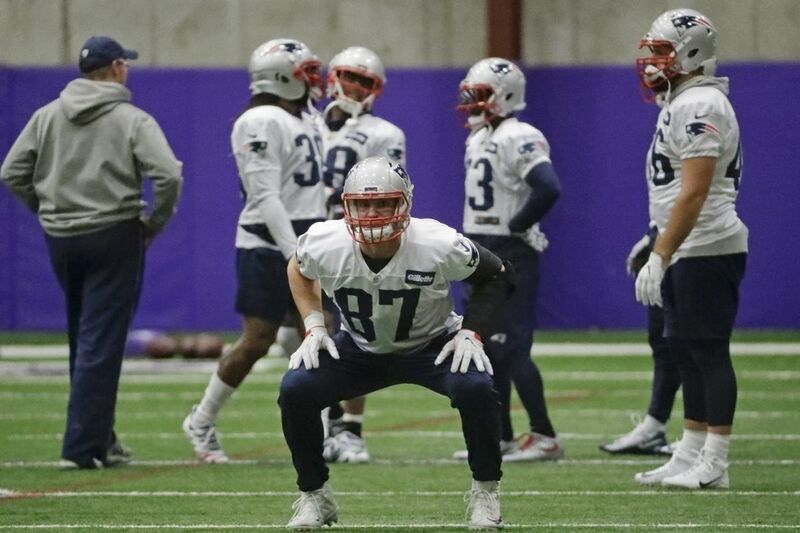 BLOOMINGTON, Minn. — New England Patriots tight end Rob Gronkowski has been cleared from the concussion protocol and will be ready to face the Eagles on Sunday in Super Bowl LII. Gronkowski suffered a concussion in the second quarter of the Patriots' 24-20 win over the Jacksonville Jaguars in the AFC championship game on Jan. 21. He was a limited participant in practice Wednesday. On Thursday he was a full participant. "We got the word today that I was cleared and it was nice to hear from the doctors," Gronkowski said to a large press gathering. "We went through the whole process and we are ready to roll." He said he knew all the time that he would return. "They were more on the cautious side rather than putting me out there right away with the bye week in between, which helped big-time," Gronkowski said. Gronkowski had another huge season with 69 receptions for 1,084 yards and eight touchdowns in earning his fifth Pro Bowl selection. When asked what he was able to do at practice, he replied, "Everything, I was cleared, I was able to do everything I was scheduled to do out on the field, so I will be ready to roll in the game, will be full-go, ready to roll." Also for the Patriots, defensive lineman Deatrich Wise (concussion) was also a full participant. Defensive backs Malcolm Butler (illness) and Brandon King (knee) were also full participants after practicing on a limited basis Wednesday. According to the pool report, quarterback Tom Brady again practiced with only black tape and no glove on his right hand, which was injured before the AFC title game. For the second straight day, Eagles defensive tackle Tim Jernigan did not practice because of illness. The other players who were listed on the injury report were all full participants: running back Jay Ajayi (ankle), defensive tackle Fletcher Cox (calf), cornerback Ronald Darby (illness), and linebacker Dannell Ellerbe (hamstring). The Eagles said in the pool report that they expect Jernigan to play Sunday even if he doesn't practice this week. Despite being a full practice participant, Ajayi was limited in some drills. Coach Doug Pederson said if was precautionary to give his ankle a rest. Defensive end Vinny Curry was looked at by trainers toward the end of practice after he got the fingers on his left hand caught in another player's face mask during a team drill. "He's fine," Pederson said. Darby did not attend the morning media session, but according to the report he had a strong practice.. For the second straight day, the Eagles met the media before they practiced and the Patriots met afterward. Throughout the week Pederson has talked about what a great mentor the injured Jason Peters has been on the younger players, especially his replacement at left tackle, Halapoulivaati Vaitai. Peters, 36, suffered season-ending MCL and ACL tears in his right knee Oct 23 in a 34-24 win over the Washington Redskins. While some have speculated that Peters won't be able to return from the injury, Pederson isn't one of them. "He has been a great asset to the offensive line as a big leader of that unit," Pederson said during his news conference Thursday. "I still think he has a few years left to play before he steps away." In June, Peters signed an extension with the Eagles through 2019. His cap hit for 2018 is $11.66 million, according to spotrac.com. It's possible the Eagles will try to negotiate that deal if Peters does intend to return. NFL Players Association executive director DeMaurice Smith didn't hesitate when asked Thursday whether he would consider extending the union's labor deal with the league. The 10-year collective bargaining agreement is set to expire after the 2020 season. "We prepare for war," Smith said. "This CBA was painfully negotiated at a time when the league secured a $4 billion war chest to basically put us out of business," Smith added. "… I could never imagine a world where you simply put a page on the back of it that says, 'This document is extended until 2035.'"